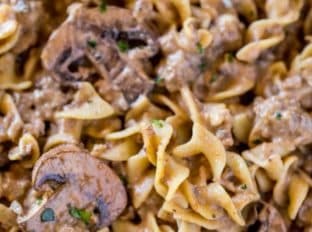 Ground Beef Stroganoff made with low cost ground beef with all the classic beef stroganoff flavors in less than 30 minutes! Creamy Pastas are a point of weakness for me…and just about every client I cooked for. 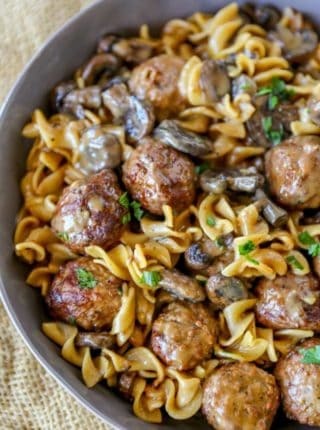 This pasta is a 30 minute version of my favorite Crazy Tender Beef Stroganoff and Meatball Stroganoff but with all the delicious flavors you’d normally expect! 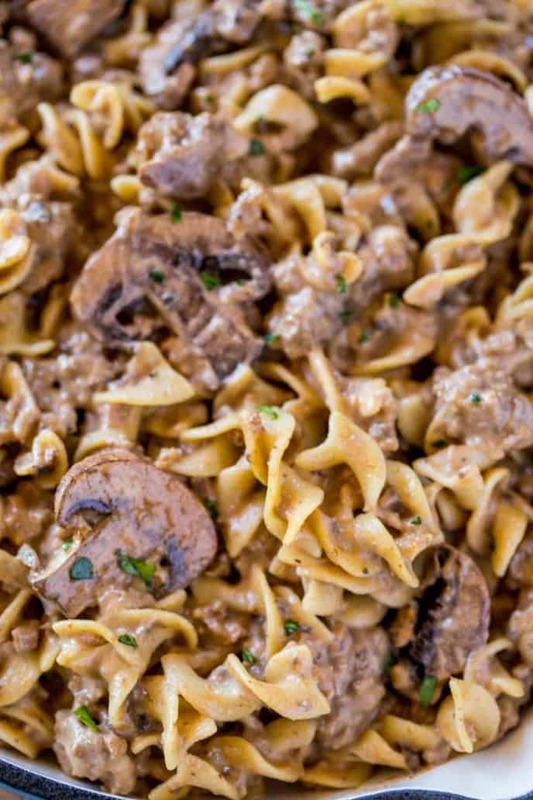 If you’re a fan of the site you’ve already seen three different stroganoff recipes. 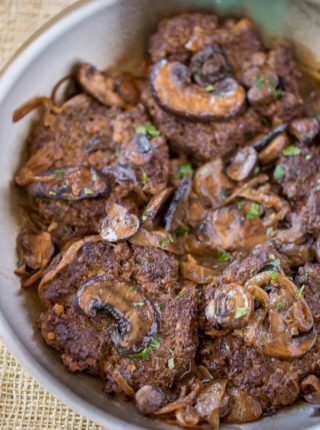 This one is the easiest one yet using ground beef in place of steak. 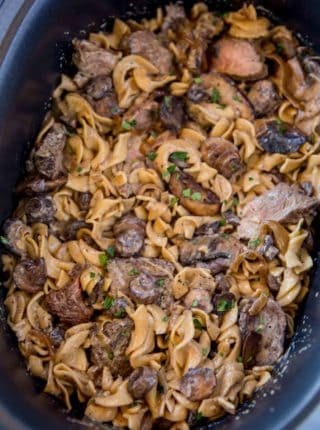 And even better this is a ground beef stroganoff recipe without cream of mushroom soup. 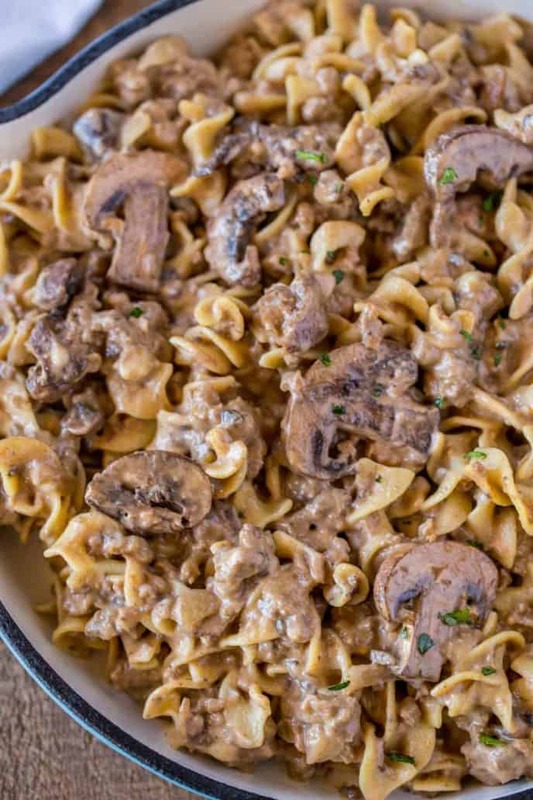 This ground beef stronganoff (or hamburger stroganoff) still has all the traditional flavors of beef stroganoff including sour cream, beef broth, Worcestershire sauce and mushrooms. The only thing missing? Steak. I promise this is still the best version of comfort food you’re going to want as we head into the cooler months of the year. You can even make this in the slow cooker! Brown the ground beef well and add it to the slow cooker along with the rest of the ingredients except for the sour cream and pasta. Cook on low for 4 hours then mix with sour cream and cooked egg noodles before serving. 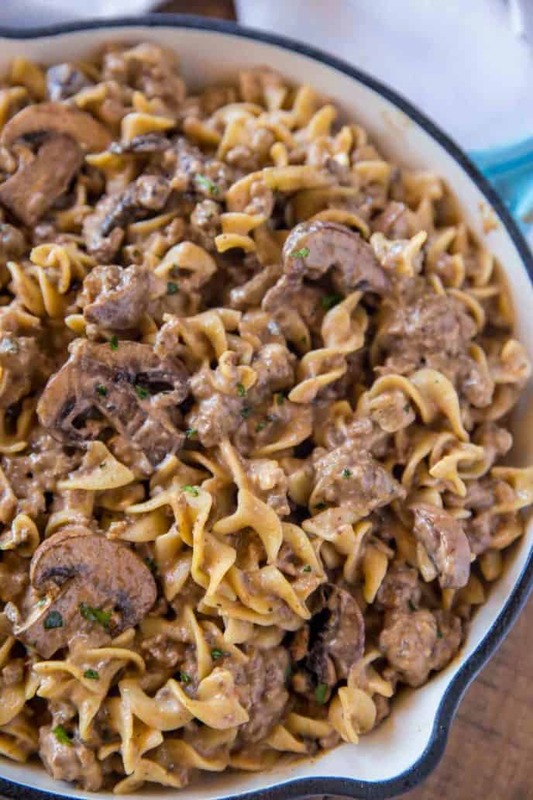 You can also make this ground beef stroganoff with cream cheese instead of sour cream for a thicker, richer sauce. If you want to thin it out more add an additional half cup of beef broth to your mixture. 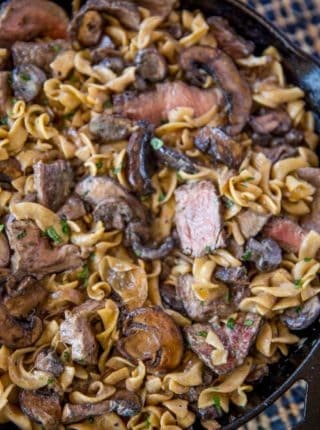 You can make this pasta dish into a casserole by skipping the cornstarch, doubling the beef broth and baking at 350 degrees for 18-20 minutes. Just be sure to cook the pasta two minutes shy of the instructions on the box. Can you use something else instead of beef? Yes you can always swap out the ground beef for ground chicken or ground turkey. If you do cut it out strictly for health reasons you can pump the beefy flavor back up with an additional tablespoon of beef base in the mixture. If you want to cut even more calories from the mixture you can even swap out the sour cream in favor of greek yogurt. Skip the Cream of Mushroom Soup! I use fresh mushrooms in the recipe and skip the cream of mushroom soup altogether. Because of this I actually choose brown (or crimini) mushrooms instead of classic white button mushrooms. The crimini mushrooms offer a deeper flavor for no additional cost and they even look better in the recipe. A win win all around! For extra flavor and bulk (that’s healthy!) I actually chop up the stems of the mushrooms and cook them along side the beef. This kicks up the flavor a lot! Cook the egg noodles a minute shy of the directions and drain (do not rinse). Add the ground beef, salt and pepper to a large skillet, break apart into large crumbles and cook until well browned (about 6-8 minutes) then remove from the pan. Add the butter, mushrooms, onions and garlic and season with salt and pepper. Sauté until golden brown, about 5 minutes then remove from the pan with a slotted spoon and set aside. Add the Worcestershire sauce, sour cream, beef broth and cornstarch whisking it together until well combined and the sauce starts to thicken. Add in the mushroom mixture, ground beef and pasta and mix to combine before serving. I made this yesterday and it was AMAZING! No extra salt or pepper needed at all! I do have a quick question, however. What is 1 actual serving? Thank you so much for sharing this recipe with the world, it is absolutely DELICIOUS! I’m so glad you enjoyed it! One serving is about 1 cup. What about the browned meat ? When should it be added ? Thanks for catching that! You’ll want to add the ground beef back in with the mushroom mixture and the pasta. This is such an easy family staple! I love stroganoff and this easy version sounds so good! Totally pinning this to my Comfort Food board. My family loves stroganoff! Is there a substitution you can recommend for the sour cream? You can substitute with greek yogurt if you’d like.